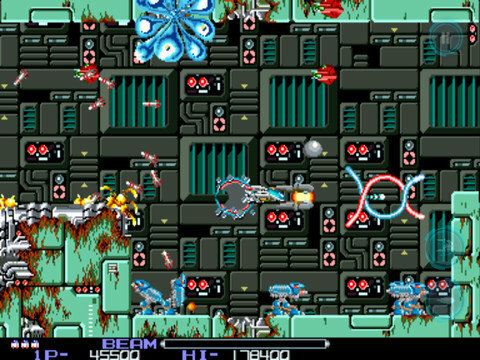 It has been nearly 2.5 years since I reviewed DotEmu’s original iPhone-only port of the classic side-scrolling space shooter R-Type. 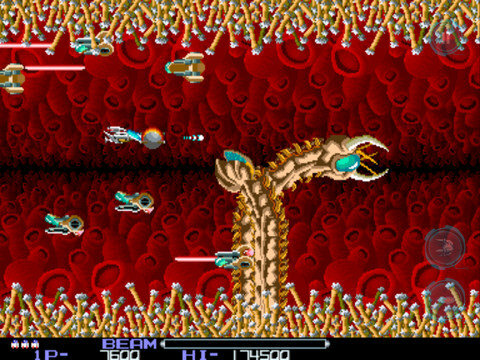 At the time I called the iOS release of R-Type “Most Decidedly And Wonderfully Retro“. The team at DotEmu did an amazing job bringing this tough-as-nails arcade classic to iOS, offering up a gaming experience that relied on the brilliance of the source material rather than trying to ‘remix it up’ into something new and (probably) less entertaining. A lot has changed on the App Store since September 2010, we’ve had a couple more iterations of the iPad, Retina displays, and the iCADE. The publishing deal with EA ended and DotEmu chose to revisit this flagship title and after a six month hiatus the game is back on the App Store as a self-published title that is a bit more refined than the original. Though R-Type just recently turned 26 years-old, the game still holds its own very well today, even when up against more recent offerings like Sine Mora with its fancier modern graphics. Many of the comments I made in my previous R-Type review still hold true, but DotEmu has trimmed some of the fat, releasing an even more solid game than the version they previously published with EA. For instance, the new release is a Universal app so now you can play on your iPad and though it is a retro title, the all-new release looks sharper and crisper than its predecessor. Possibly the biggest change that DotEmu made was to revisit the control schemes. They’ve nixed the somewhat niche coin-op mode which made it look like you are standing at a coin-op arcade cabin, in favor of adding iCADE support. The tilt/touch combo option is gone as well. Now you have two on-screen control options: touch and pad. With the touch option you simply drag your finger anywhere on the screen to move your ship forward backward up and down and you have two buttons to control your Force module and firing your weapon. These two buttons can be re-positioned anywhere on the screen. The second option, pad replaces the touch and drag control with a four-direction d-pad. I found both the iCADE and pad controls to be a little bit sluggish and unable keep up with the action on the screen. Since you can only shoot forwards, this means that sometimes enemies will get past you and you just can’t move fast enough with these controls to retreat and position yourself in front of them again before they fly off the screen. Maybe this slowness is more indicative of the original gameplay, I’m not sure. However, it would be nice if there was a sensitivity slider to give the controls a little more oomph. Come to think of it, the touch controls could use just the slightest of sensitivity bumps as well, but even as they are, they are satisfying and my preferred on-screen control option. 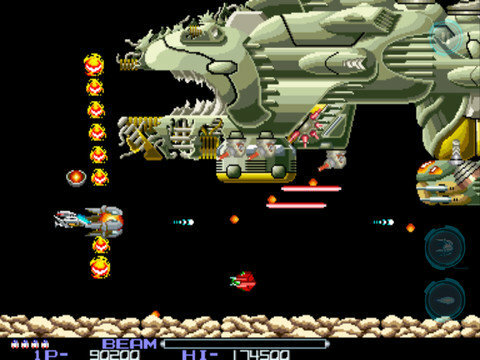 The gameplay itself has remained the same and the game still contains three difficulty modes, unlimited, normal and insane. Unlimited gives you unlimited lives and normal mode restricts you to three lives. As for the insane difficulty…once again, that’s best left for the professionals. The unforgiving, one hit and you lose a life style of play will definitely not appeal to everyone, but those of us who grew up in the coin-op era will relish in the challenge of re-honing those long forgotten skills. 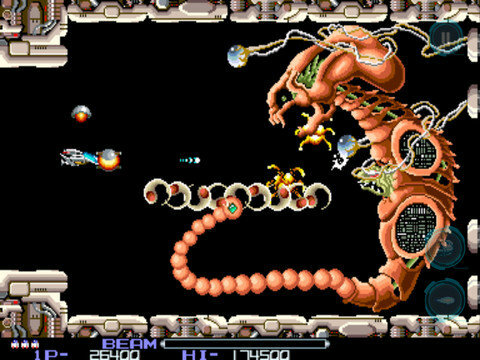 Even after 26 years, R-Type remains one of the most fun and challenging side-scrolling space shooters available. DotEmu has really pulled out all the stops with this new self-published iOS release, improving everything from the graphics to the controls, but leaving the game play in tact. They’ve succeeded in creating a satisfying mobile release that will appeal to both new and longtime players of this coin-op classic.